Apply yellow eyeshadow on the lids stopping before your natural crease line. Also apply it on inner half of lower lash line. Apply the turquoise eyeshadow on your crease with a thin brush, and blend the edges using window wiper & swirling motions. Also apply this on the outer half of lower lash line. Apply black eyeliner and wing it slightly at the ends. Apply a black kajal/pencil liner on lower lash line & smudge it a little with a brush. Lastly, apply black mascara on top & bottom lashes. How To: Same look. 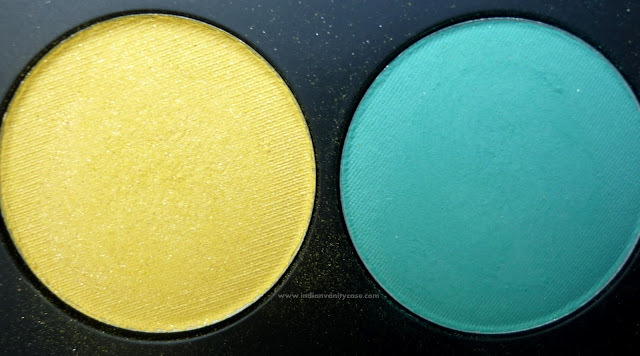 I just applied a matte black eyeshadow, called Stiletto from Too Faced Naked Eye Palette (Review here) on top of the turquoise & blended it inwards. Im loving the hyper sharp eyeliner! You totally carry off the yellow! Lovely <3 The combo is fab!!!! Very summer-y. The colours are so lovely. This is such a creative way to pull off the bright colors! I want those inglot colors. They are so pretty! Yellooooooooooow! Some part of my soul has been commanding me to use yellow on my eyes. I haven't gotten around to it yet but you're definitely inspiring me! wow.. beautiful colors!! love the crease shade and the way u've blended it! good work!